"User : You can always just put a password on your server and it works..."
Author : I see it differently. I prefer to remove a person from the whitelist, it is more efficient than to distribute the new passwords to each users. In addition you can choose the activation date and deactivation is automatic, also compatible with the system of donations thanks to the server's command. You can disable and enable the filter with a simple button ON/OFF, instant, without reboot the server. And a password can be leaked and shared. Whitelist system, editable in real time, activable and unactivable with a simple buton(ON/OFF) without needing to reboot your server. Players trying to join the server will be blocked before the ressource download and will receive a message that you typed yourself. It help to not having loss of performance. Optimisated and clean. No need to constantly change the password and make sure to share it constantly. You can block your server to the public temporarily. Note : Since the update 2.0 it is possible to program the activation and deactivation of automatically allowing you to select the day of activation of the week. -Command to Open the panel: "whitelist_system"
Only An admin can open the panel and add player in the whitelist. sv_addwhitelist "name of the user" steamid64 (Since version 2.5 - Marsh 2017), can work with donation systems. Set the activation date, choose the days of the week when the access limited by the list. "What is the white list ?" 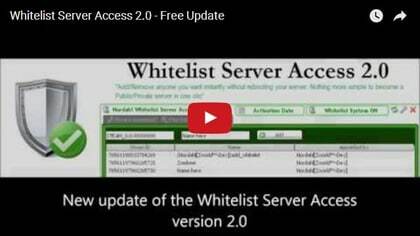 The whitelist is used to restrict the access to your server only for the people placed in the list. "Yeah... But there is the password option for this !" When you want to do something serious, it is nice not to have to type the passwords. If a player is getting annoying, you just have to delete him from the whitelist and he will not be able to come back. You don't have to change your password or sending it to everyone. It's faster and cleaner. "Do we need to reboot the server when we add/remove someone in the whitelist? Or when we turn on and/or off the whitelist ? "No it is instantaneous. "Who Can open the Whitelist?" Function used is ply:IsAdmin() and ply:IsSuperAdmin(), ULX is not installed on the servers by defaut reason I dont work with the ULX if you have suggestion to improve it i do that. -To Open the panel: "whitelist_system"
The system can be activated/unactivated in real time. It was created because we needed it. For my project, we needed some whitelisted servers for players to play beetween them and not being disturbed by intruders. It really helps to have more mature players. A config file allows you to write your own message and adding a link for players not allowed to join. Then you are free to organize your own methods. This system block the players even before the material download, it is optimised and it help to avoid loss of perfomance. In my case, players in my whitelisted servers know that they can play in a roleplay style without getting killed without any sense. Instead of non-whitelisted servers.